of travelers select their destination online, giving digital advertisers an opportunity to influence the decision-making process. Understanding trending destinations, shifts in the accommodations landscape, customer loyalty trends and in-destination opportunities is essential. We researched the 25 destinations on the Bing Network with the highest year-over-year search volume growth. While Cancun and the Caribbean top the list, unconventional destinations – including India, Bangladesh, Maldives and Kenya – have become increasingly popular. Advertisers can research their own trending keywords using the Bing Ads Keyword Planner. Airlines adding new destinations and more convenient routes to hubs could increase destination searches. Datamining hashtags on social media can help advertisers discover popular new destinations. High value travelers that book private accommodations also book hotels. This openness coincides with the rise of boutique hotels, fueled by millennial travel preferences. Recently, many major brands have announced boutique branch launches. For advertisers, travelers are more open than ever to the variety of lodging options. Search creates brand awareness on Online Travel Aggregators (OTA). Travelers exposed to brands via search ads are more likely to visit those same brands on an OTA. Why do travelers choose to stay in hotels rather than private accommodations? The majority of U.S. travelers belong to a loyalty program, totaling over a billion accounts. Even though that figures grows year-over-year, more than 54% of members are inactive. We found that travelers who belong to loyalty programs comparison-shopped across multiple travel sites. Elite members are almost as likely as non-members to comparison-shop, but they are more likely to travel and engage with ads. Frequent travelers expect personalized and relevant offers in exchange for their loyalty. Travel's third-largest and fastest-growing segment is activities – all of the things travelers do when they get there. In the U.S., 53% of travelers shopped for activities online during their last trip. Activities suppliers using third-party reservation systems have grown over 400% since 2011. The biggest online travel agents have all moved into this space. Gross bookings for online activities are expected to more than double from $12 billion in 2015 to $27 billion in 2020. Shifts in the travel landscape are creating new opportunities for travel marketers to reach high-value, frequent travelers at every stage of their decision-making journey. Monetize new trending destinations before your competitors with solutions like the Bing Ads Keyword Planner tool. 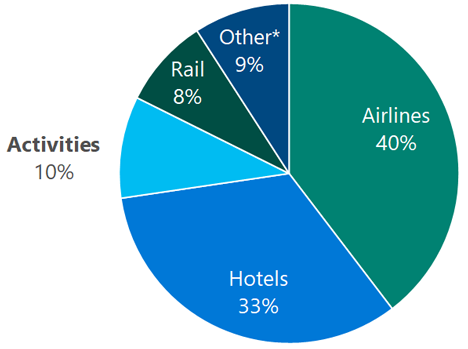 Influence travel purchases on OTAs with search ads. Give loyalty members a reason to stay loyal by using Custom Audiences to target customers with personalized offers. Use remarketing to help travelers book activities. 1 Phocuswright and Microsoft, Future of Travel, 2017. 2 Microsoft internal, U.S., January 2016 – June 2016 vs January 2017 – June 2017. 3 Private Accommodation Muscles in on Hotels in the U.S. and Europe, Phocuswright April 2017. 4 “Why every major hotel brand wants in on the boutique hotel business”, Skift, December 2014. 5 Boutique Hotels: Market Research Report, IBIS World, June 2017. 6 Microsoft Internal Data, June 1 – 7, 2017. 7 Private Accommodation Muscles in on Hotels in the U.S. and Europe, Phocuswright April 2017. 8 Phocuswright and Microsoft, Future of Travel, 2017. 9 Phocuswright and Microsoft, Future of Travel, 2017. 10 Phocuswright’s Tours & Activities Come of Age: Global Travel Activities Marketplace 2014-2020. 11 Phocuswright and Microsoft, Future of Travel, 2017. 12 Phocuswright’s Tours & Activities Come of Age: Global Travel Activities Marketplace 2014-2020. 13 Phocuswright’s Tours & Activities Come of Age: Global Travel Activities Marketplace 2014-2020. 14 Phocuswright’s Tours & Activities Come of Age: Global Travel Activities Marketplace 2014-2020. 15 comScore, PlanMetrix, U.S. August. 2017, industry categories based on comScore classifications.